It wasn’t the type of start the Dalhousie men’s hockey team was looking for. A 5-2 loss to Saint Mary’s and a 5-4 overtime defeat to Acadia leaves the Tigers with one point to show for themselves through the opening weekend. Despite a slow start to the season where they were outmatched by the Huskies and then blew a three-goal lead the next night, the Tigers are keeping their spirits up. The two games took place at Dal’s new home rink, the Halifax Forum, although only Saturday’s game can be considered a ‘home’ game. Saint Mary’s has claimed home ice advantage at the venerable rink since 2003. When the Tigers faced Acadia in their home opener last Saturday, they played the same way they did the night before. What began as a strong showing turned disastrous for the Tigers midway through the second period. Cullen Morin opened the scoring for Acadia, tying things up at one. Matt English then netted one for Dal, a first for the AUS rookie, and Patrick Daley replied twice, giving the Tigers a seemingly convincing lead. Penalty trouble was once again a concern for the Tigers. Accumulating 29 penalty minutes in a game versus only six for the opponent is bound to tire a team. Although Acadia didn’t score on a single power play, lack of control is ultimately what led the Tigers to surrendering a victory that was well within their grasp. Acadia’s Leo Jenner made a wrist shot with four minutes left in overtime, securing the Axemen’s comeback. Getting used to a new setting has been easy so far for the Tigers. Although Memorial Arena will be hard to forget, a sense of familiarity with the Forum is building. “Having our logo painted on the ice makes things feel just a little bit more like home,” says Kewin. 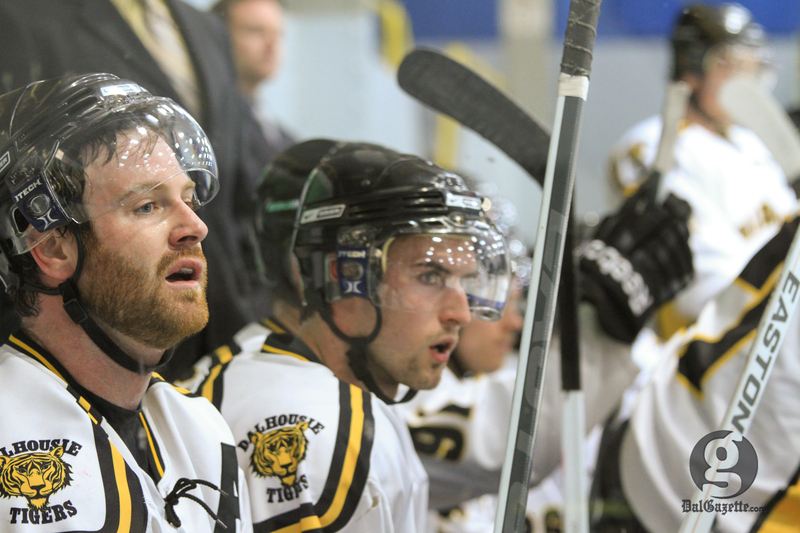 The Tigers shoot for their first win of the season Friday, Oct. 19 in Moncton. They then face St. Thomas the next day to finish off their road trip. Originally from Lahore, Pakistan, Arfa moved to Canada at the age of nine. She spent a year in Toronto before moving to Halifax. In the East Coast, not sure how (must be a Canadian thing! ), but she began to watch and love hockey. Arfa started writing for the Gazette in her last year of high school as part of a cooperative education internship. Once she graduated, she came to Dal to study Political Science. Aside from continuing to write for the paper, Arfa completed an internship with Global Maritimes.